A VAST LEFT WING CONSPIRACY: Is Team Obama and Senior Obama Adviser Valerie Jarrett Behind the Leak of Hillary Clinton’s Email Scandal? HEY HILLARY … IT LOOKS MORE LIKE A VAST LEFT WING CONSPIRACY. Obama to self, This woman actually thinks I am going to let her be president? What, Hillary did not realize she was #2 on the list, right below The Tea Party? As Legal Insurrection opines, if Valerie Jarrett takes Billary down, she will have done the nation a favor, regardless of motive. It really does appear that the enemy of your enemy, is your friend. It would seem, if Klein’s sources are correct, that Barack Obama does not want Hillary Clinton anywhere near the White House in 2016 to potentially undo any of his far left transformations of America for political expedience. 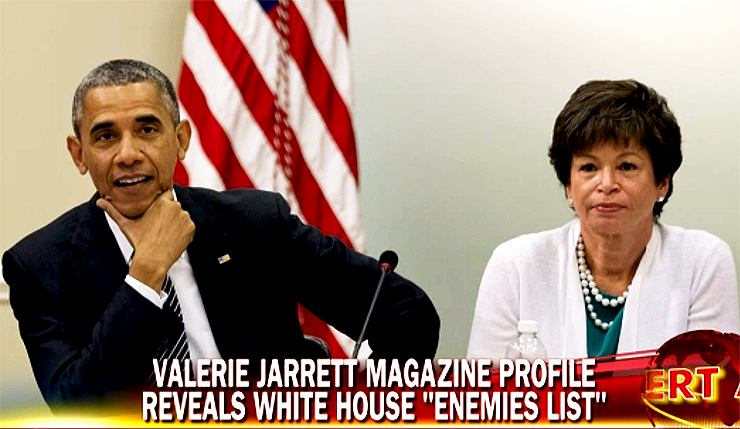 Could Obama or his brain, Valerie Jarrett, really be this all-consumed and petty? If so, it may not only sabotage Hillary’s 2016 run for the presidency but the Democrats as well and in the end truely be the undoing of all of Obama’s disastrous policies. WHAT IF … The United States of America Had a Lawless President Who Could Care Less About the US Constitution & Was Hellbent on Harming We the People? Is it any wonder that if Barack Obama only surrounded himself with political advisers like this why Obamacare has been such a mess both in implementation and policy. 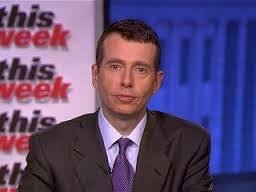 Former Barack Obama adviser David Plouffe appeared on ABC’s ‘This Week’ on Sunday and showed us once again that “Denial” is not just a river in Egypt. Plouffe actually said that it was an “impossibility” for the political notion that the GOP would run on an anti-Obamacare platform in 2014 and 2016. Wanna bet? For some reason Plouffe, Obama and his minions think that the issue Americans are upset is because they can’t log on to the “glitchy” web site, Healthcare.fail. Wishful thinking. The problem is that Americans were purposely lied to for political purposes so to pass Obamacare and 5+ million Americans to day find themselves with a canceled insurance plan when they were told they could keep it if they liked it. Sorry Dems, you will pay a dear price for lying and them ramming Obamacare down the throats of Americans in a 100% partisan vote. There is a reason why Americans no longer trust Obama and Democrats will feel the effects. But even when caught with defending the indefensible, the Obamacare just continues to spin. Obama Adviser Axelerod Says, Romney’s Effort in Pennsylvania a Sign Mitt is in ‘deep trouble’ … Hmm, Then Why Dispatch Bill Clinton to PA? This morning on FOX News Sunday, Obama senior political adviser David Axelrod told Chris Wallace that the Romney campaigns move to Pennsylvania was a sign of desperation and that they were in “deep trouble”. Senior Obama campaign strategist David Axelrod said Mitt Romney’s visit to Pennsylvania shows the GOP nominee’s campaign is in “deep trouble” and losing in the traditional battlegrounds. Axelrod told Chris Wallace on “Fox News Sunday” that the Romney campaign’s move into Pennsylvania is a sign of desperation because they are trailing in polls in Ohio, a state no Republican has won the election without. Ok, if it is such a sign of desperation on the part of Romney campaigning in Pennsylvania, what does one call it when Obama dispatches Bill Clinton to the Key Stone state? That is correct, Team Obama feels the need to send former President Clinton to PA to stem the “mittemtum”. If its such a waste of time and a sign that Romney is in “deep trouble”, how does Axelrod justify sending Obama’s greatest asset, Bill Clinton to Pennsylvania. In fact, as reported at the Gateway Pundit, Clinton is scheduled to do four rallies in PA. I would dare say that it just might be Obama who is in trouble in Pennsylvania. Isn’t it interesting that Obama cannot go himself to Pennsylvania to stump in front of those folks who cling to their Bibles and guns. When will blue collar Democrats understand that Obama is 180 degrees different from Obama. A vote for Obama will end coal and any energy jobs in PA. However, in the end when talking spinning the battleground states and what party is ahead, I think it comes back to who you think is telling the truth. To hear the GOP and Democrats discuss who is ahead is like listening to a divorce case. One of the two has to be lying as the laws of physics prove that both Obama and Romney can’t win convincingly. If that is the litmus test, who is telling the truth, sorry but Team Obama has no credibility. For folks who can’t tell us the truth about Benghazi prior to an election as have not wanted to answer difficult questions about FEMA screw ups like running out of water following Hurricane Sandy … who is really going to believe you now?